The Ordinary of Newgate his Account of the Behaviour, Confessions, and Last Speeches of the Malefactors that were Executed at Tyburn on Friday the 9th of March, 1704/1705. At the Sessions held at Justice-Hall in the Old Bailey, on Wednesday the 28th of February last, and on Thursday and Friday the 1st and 2d Instant, 8 Persons, i. e. seven Men and one Woman, having been Try’d, and found Guilty of Death, received their Sentence accordingly. Of these 8 Persons, 5 being by her Majesty’s gracious Reprieve, respited from Execution, they who are now ordered for it, are only these 3, viz. William Pulman, Edward Fuller, and Elizabeth Herman. On the Lord’s Day, the 4th Instant, I preach’d to them, both in the Forenoon and Afternorn, upon part of the second Lesson, appointed for that Morning-Service, viz. Luke Ch. 15. v. 18 & 19. I will arise and go to my Father, and will say unto him, Father, I have sinn’d against Heaven and before Thee; And am no more worthy to be call’d thy Son; Make me as One of thy hired Servants. Having explain’d the Parable of the Prodigal Son, of which the Text is a part, I shew’d from thence how a Sinner must gradually proceed in his Repentance. He must take a firm Resolution to return to a better Life. He must confess his Guilt, not only to God, but where the Offence has given any publick Scandal, he must confess it to Man also. He must rather aggravate than palliate his Crime. He must be severe towards himself, if he will have God to be merciful to him. He must humble himself to the lowest degree, and look upon himself as unworthy of the least Favour, but worthy of the greatest Punishment, and incapable of returning to God without his Converting Grace, which he ought earnestly to implore. And Lastly, I shew’d how acceptable such a Repentance (attended with all these) was to God, and how beneficial therefore it would prove to them that should exert themselves therein. These were the Principal Heads on which I then discours’d to my Auditory, both in the Morning and Afternoon; concluding with a twofold Exhortation; First, To the Strangers that were come to see the Condemned Persons, that they would put up hearty Prayers for them, and be thankful to God, who by his restraining Grace, had kept them from falling into their Sins, and under their Condemnation. And Secondly, To the Prisoners, and particularly those Condemned to die; That they would desire the Prayers of all good People, which they stood in so great need of; and stir up themselves to Prayer, and implore the Spirit of God to their assistance therein; That they would examine themselves, and take an exact Survey of all their past Sins, so far as they could remember, and seriously consider how they had lived before, and how they were now fit to die, and what would become of them after Death. Yesterday being the Anniversary Day of the QUEEN‘s Accession to the Throne, I preach’d again both in the Morning and Afternoon, to the Prisoners in Newgate, and other Persons there present; and my Text was, Ps. 40. 3. Be pleased, O Lord, to deliver me: Make haste, O Lord, to help me. After I had open’d the Text, and by the by spoken something concerning the Solemnity of the Day; shewing how Men are in a double manner Guilty, who living in a Country where the Gospel shines in its full Brightness and Purity, and under a Government so just, so equal, and so easy as this is, are (nevertheless) wilfully ignorant of Christian Duties, and disobebient to God and their Superiours, and unjust, mischievous and oppressive to their Neighbours. Then I proceeded to discourse on that Subject which I thought then most proper for my Auditory, which was to shew from the Text, How it concerns all Men (especially great Offenders) to be earnest in their Application to God for Deliverance, both From their Sins; And, From the Punishment due to them. How they came to be prompted to, and by degrees hardened in Sin. How they might recover themselves by that sincere Repentance which is of absolute Necessity to their Pardon and Salvation; and which is the Work of God’s Spirit, for which they should pray with fervent Zeal and Perseverance. I. William Pulman, alias Norwich Will, Condemned for Robbing Mr. Joseph Edwards on the High-way, upon the 30th of December last, and taking from him a pair of Leather-Bags, a Shirt, 2 Neck-Cloths, 2 Pocket-Books, 25 Guineas, a half Guinea, a half broad Piece, and 4 l. in Silver. When I put him upon his Confession, both of this and other Facts he might be guilty of, he at first pretended (as he did at his Tryal) that he knew nothing of that Robbery committed upon Mr. Edwards. But when I shew’d him, not only how little available, but how mischievous such a Denial was to him, in case he was really Guilty of the Fact; he at last confess’d it, owning that he had 5 Guineas and 40 Shillings in Silver for his Share in that Robbery. He confess’d also, That he (with some others he named) had several times, for these 4 Years past, taken Bags, Trunks, Boxes, and such like Things, from behind Horses, Coaches, and Waggons; but he protested to me, that he never broke any House, nor stole any Goods out of Shops. He further said, That he did not know any of the Proprietors or Owners of the stol’n Goods in which he was concerned, save Mr. Edwards; and though he should know them, or could send to them, yet he could make them no Satisfaction; all being spent, and he left poor. So true it is, That Goods unlawfully gotten do not profit. He therefore pray’d God, and those he had wrong’d, to forgive him. Being ask’d, When and Where he was born, and how he had spent his Life, he gave me this further Account of himself, That he was about 26 Years of Age, born in the City of Norwich, of honest Parents, who brought him up well, and put him to a good Trade, viz. That of Barber and Perriwig-maker; to which he serv’d the full time of his Apprenticeship, and then set up for himself in that City. But getting into ill Company, he was presently debauch’d, and became a very lewd Person, breaking the Sabbath-day, and abandoning himself to Swearing, Drinking, Whoring, and all manner of Wickedness; saying, That he was guilty of all Sin but Murther. In this wicked Disposition, he came up to London about five years ago, where he had not been long but he was prest to Sea; and having served not above two Months on Board the Jersey, a Third Rate, commanded by Captain Stapleton, he was discharged. And being so, he went to work at his Trade for a few Months with one Mr. Wright a Perriwig-maker in Old-Bedlam. But keeping Company with ill People, by their Example and Perswasion (and particularly by the Sollicitation of a certain wicked Woman) became a Robber. He told me, That he had served 16 Months on Board the Triumph, a Second Rate Ship, Captain Greydon Commander, and that he was in that Ship in the late Expedition to Vigo. But he sorrowfully acknowledged he had been so stupid, as all the while to take no manner of notice of the great Dangers he was in, and from which the Providence of God had preserved him. When he was returned into England and discharged, then he went sauntering about to see what he could get; and finding himself in danger of being prest again, he enter’d himself into the Land-Service , viz. in the Second Regiment of Foot-Guards, in the Company of Captain Swan, under the Command of Colonel Marsham; in which Service he was, when in December last he was Try’d, Convicted, and Burnt in the Cheek for a Felony by him committed a little before that time; which Punishment he had received long before, viz. above three years ago, for a Felony he then was justly found guilty of. He mightily lamented his sinful Life past, and begg’d Pardon both of God and Man. II. Edward Fuller, Condemned for Robbing Mrs. Eliz. Woodward of 5 s. and Mr. John Wright of a Silver Watch on the 3d of February last: Both which Facts he deny’d. But confess’d, that he had been an Ill-liver, and for these 3 or 4 Years last past concerned as a Partner with Pick-pockets. He said he never got much by that, nor could now make restitution to the Parties wrong’d, should he know them. He being asked whether he ever broke any House, or stole things out of any Shops, or Robbed on the High-way Abroad, on Horseback, or otherwise, he answer’d, no; saying, that he had never meddled with any Robberies, or Robbers of that kind. As for his Manners, he confess’d himself to have been a very Idle and Loose Person; neglecting the Business of his Calling, which was a Coach and Harnessmaker, to which he had served his Prenticeship in the Borough of Southwark, where he set up and work’d for himself a while after his time was out. He said he was about 30 Years old: An Age when he might have done most Good, but did most Evil; being perfectly sunk into Debauchery, and all manner of Uncleanness, and having abandon’d the Service of God, in which he was carefully brought up, and embraced the Sinful Lusts and Pleasures of the World. He much complain’d of the hardness of his Heart, and desired me to pray for him. He confess’d he had been in Newgate before now; but he was always either discharged, no body appearing; or acquitted, nothing being proved against him; tho’ not always Innocent of the Facts for which he was committed; But was so; when about 3 or 4 Months ago, being in the QUEENs Service under the Command of Captain Columbine in Brigadier Farindon’s Regiment, he was suspected to have deserted his Colours; but it appeared otherwise, and that his supposed Desertion was occasion’d by his being taken a Prisoner by the French, and by them carry’d into some Parts of the Spanish Netherlands; from whence making his Escape, and returning into England, he gave such satisfaction of this to his Officers, that they did not look upon him as a Deserter, but entertained him as before, in HER MAJESTIE’s Service; out of which he was afterwards discharged, upon his having broken one of his Arms by accident. III. Elizabeth Harman, alias Bess Toogood; Condemned for Picking the Pocket of Mr. John Tredwell on the 30th of January last. She would fain have deny’d the Fact; but being press’d upon the matter, she confessed her self to have been concern’d in it, and to have had 5 s. of the Money which was then taken from Mr. Tredwell, not by her self, but by another Woman that was with her, as she said; but afterward confess’d she had done the Fact. She said, that (to her great Shame and Sorrow) she had lived to the Years of above 30 (which was now her Age) without having done any good; but on the contrary, much harm to the World, and to her own Soul: This particular account she gave me of her self, That she was born at Great Marlow in Buckinghamshire; and that about 14 Years ago she came up to London, and served at first at a Silk Dyers in Thames-street, and in several other Worthy Families in this City and in Westminster; but afterwards falling into ill Company, she soon became as Lewd and Debauch’d as any of them. She, upon my asking, declar’d, that she never drew any young Woman or other into her wicked Ways; and that those she was acquainted with, were ripe in Wickedness and Lewdness before she ever knew them. But she acknowledg’d, that she had been her self very wicked indeed; a great Swearer, Sabbath-breaker, and most filthy and impudent in her Conversation and Actions; and that for these several Years past, she had made it her constant Practice to pick up Men in the Streets, and while they were committing Lewdness with her, she pick’d their Pockets. She bitterly cry’d and lamented, that she had been such an Illliver, and thought her Sins to be so great and so many, that God would never forgive her; adding, that tho’ in her Retirement she read in the Bible and pray’d, yet she found no manner of comfort, nor could understand any thing of what she read; so dull and stupified, and sunk in Sin and Darkness, and so unaccustom’d to any thing of Religion and Piety she was, that those Spiritual Means, could hardly work any good upon her. In this desperate and despairing condition she was in, I gave her such Advice and Directions as were proper for her; and from the many tears she shed, and other the Tokens of Sorrow she express’d, I hope she was at last most sensible of the Folly and Mischievous Effects of a Sinful Life. She desired me and all good People to pray for her Soul, and all wicked Persons, (especially those of her Acquaintance) to take warning by her, and to reform and amend their Lives betimes; that they might prevent both their Temporal and Eternal Destruction. And she desired all young Women above all to take care of being deluded: For there are many young Creatures that come up to London with an honest intent, who are easily Debauched and Corrupted by wicked People that get acquainted with them. Therefore her Advice to them is, that they should avoid all ill Company; which if she had done she might have lived happy. This Day of their Execution being come, they were all of them carry’d to Tyburn; where I met them: And after some Exhortation to them in general, That they would consider well, that now they were come to the very brink of Eternity, and therefore ought to clear their Consciences, &c. I then apply’d my self to each of them in particular; asking them, whether they had any thing to add to, or alter in the Confessions they had made to me: Upon which they answer’d they had not. Only Edward Fuller said, That it was not true what he had told me before, viz. That he was taken by the French; for now he owned he had really deserted his Colours, but he got himself discharged afterwards. He added, he was sorry he told me an untruth, for which (said he) I beg Pardon of God and you. But as to the 2 Facts for which he was Condemned to this shameful Death, he still persisted in the denial of them; saying, that he knew nothing of the 5 s. taken from Mrs. Woodward; and that for the Watch owned by Mr. Wright, he bought it of one Thompson, and pay’d him 3 l. 15 s. in Money for it, besides a Quart of Wine that cost him 20 pence. This was his last Declaration to me at the Tree; where I most strenuously press’d him before God upon the hope of Eternal Life, to speak the truth. He declared that he had no Animosity or Hatred against any one in the whole World, Man, Woman, or Child, and that he dy’d in Charity with all Mankind. And so did the other two. When this was over, I proceeded to exhort them to stir up their Hearts to God, to cry for his Mercy, and to beg the Assistance of his Holy Spirit in this time of need. Then I pray’d and Sung some Penitential Psalms with them; and made them rehearse the Apostle’s Creed, and repeat some Ejaculatory Expressions after me. I admonished them to warn both Young and Old against Sin; which they did; praying all Standers by and others to avoid all manner of Vice and Vicious Company, and never neglect the Service of God, as they had done to their Shame and Sorrow. Which they having said, I recommended them to God and the Direction of his Grace: And so left them to their private Devotions, for which they had some time allowed them. Then the Cart drew away, and they were turn’d off; Calling upon God to have Mercy upon them, in these and the like Ejaculations, utter’d and often repeated by each of them. Lord have Mercy on me, a miserable Sinner! My Sins are innumerable, and my Soul is in anguish, Lord comfort me, and heal me! Lord into thy Hands I recommend my Spirit! Sweet Jesus, take me to thy self: Take me to thy Mercy! Open me thy Gates! Lord, I come, I come! This is all the Account here to be given of these Dying Persons by PAUL LORRAIN, Ordinary of Newgate. Friday March 9. 1705. THE Exemplary Life and Character of James Bonnell, Esq. ; late Accomptant General of Ireland. To which is added the Sermon preach’d at his Funeral by Edward Lord Bishop of Killmore and Ardagh The Life by William Hamilton, A. M. Archdeacon of Armagh. Attested by Six of the most eminent Bishops in the Kingdom of Ireland. THE Necessary Duty of Family-Prayer, and the deplorable Condition of Prayerless Families consider’d. In a Letter from a Minister to his Parishioners. With Prayers for their Use. A Discourse concerning Sins of Infirmity and wilful Sins, with another of Restitution. By the Right Reverend Richard, late Lord Bishop of Bath and Wells. 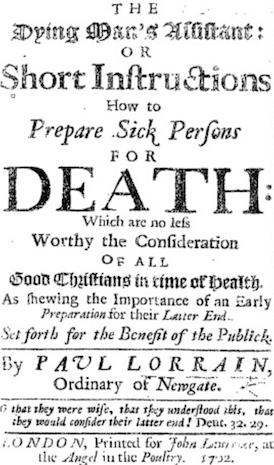 Price 3 d.
Ordinary of Newgate Paul Lorrain published this professional guide on ministry to the dying. BOOKS set forth by Paul Lorrain. Ordinary of Newgate, viz. THE last Words of the Lady Margaret De la Musse: And The Dying-Man’s Assistant, both printed for J. Lawrence at the Angel in the Poultry. And A Guide to Salvation, Sold at the Star in St. Paul’s Church-Yard. Sold by Joseph Downing in Bartholomew-Close. THE Christian Education of Children. In a Letter to a Friend. In which are contain’d the Fundamental Truths of Religion, and the Duties of a Christian Life. Profitable for all sorts of Persons; but especially recommended to Schools of Charity. Printed for R. Sympson at the Harp in St. Paul’s Church-Yard, 1704. Rpbert Whitledge, Bookbinder, now living at the Bible in Creed-Lane, within Ludgate, where all Booksellers, and others, may be furnshied with the WELSH Bible, WELSH Common Prayer and WELSH Almanack, and with all sorts of other Bibles and Common-Prayers, large and small, with Cuts or without, Rul’d or Unrul’d, Bound in Turkey Leather, extraordnary or plain, or unbound. Also the Statutes at large, and Articles and Canons of the Church of England; Tate and Brady’s new Version of the Singing Psalms, the Common-Prayer in French, the new Book of Rates compleat; and also all Books neatly Bound. London, Printed by J. Downing in Bartholomew-Close near West-Smithfield. 1705.